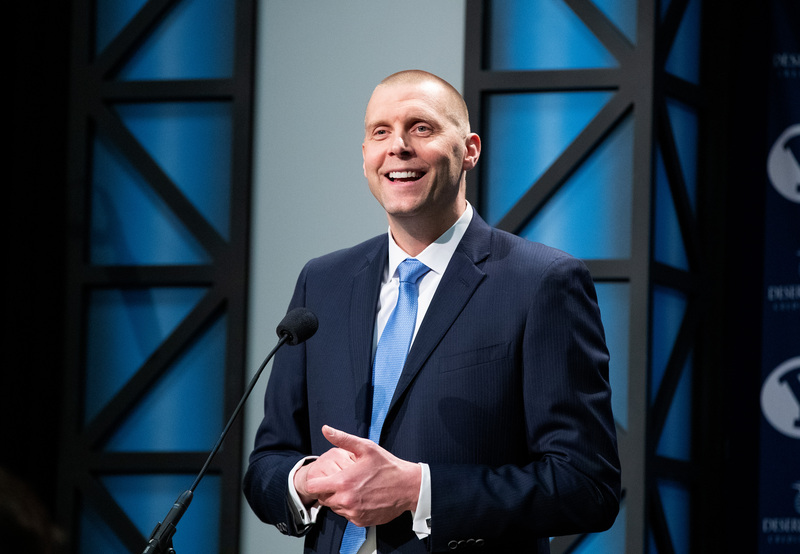 BYU named Mark Pope as the 19th head coach of the men’s basketball team April 10. Pope was an assistant coach under Dave Rose from 2011-15, during which time BYU recorded four straight 20-win seasons that all led to postseason appearances, including three NCAA tournament bids and a 2013 NIT tournament berth that ended in a semi-finals appearance. Before his BYU stint, Pope was an assistant coach for a year at Wake Forest University and the director of basketball operations at the University of Georgia. Pope returns to BYU after coaching at UVU for the last four years, where he led the Wolverines to a 77-56 record. Over the last two years the Omaha, Nebraska, native posted back-to-back 20-win seasons, going 48-21 overall. He hopes to bring success back to BYU, saying he and his staff will be “relentless” in their pursuit of excellence. 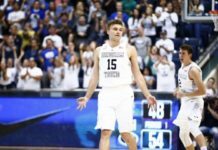 The 2018-19 campaign became Pope’s finest season and perhaps put him on the radar of a BYU team that’s coming off a less-than-impressive year. Pope’s Wolverines posted a 25-10 record during the 2018-19 season and a 14-1 record at home. His 11-4 record in non-conference play was good enough for a UVU record, as was its 22-game win streak at Orem’s UCCU Center. Averaging 24 wins over the past two seasons, Pope’s 2017-18 Wolverine’s squad started a season against two of the countries top five teams: No. 4 Kentucky and No. 1 Duke. UVU lost both of these games, losing to Duke by 30 points, but bounced back with an 8-2 record over its next ten games. From start to finish, Pope’s UVU teams went from winning just 12 games in his first season as the head coach to their school record 25-win season in 2018-19. Pope led the Wolverines to three consecutive appearances in the postseason from 2017-19, with all three appearances happening in the CBI tournament. UVU would enjoy at least one tournament win each season, with its best appearance coming 2016-17 when its tournament ended in the semi-final round with a 74-68 loss to Wyoming. What seems to be an underlying theme for Pope’s coaching success is his loyalty and love for his players. 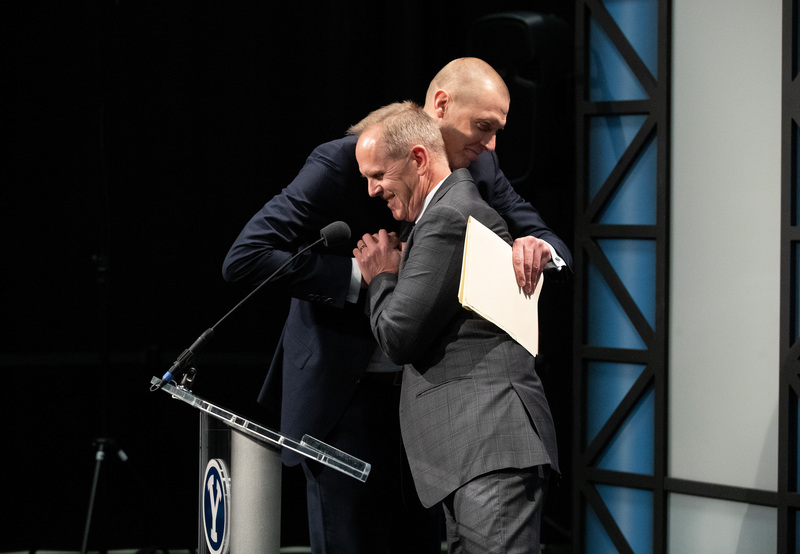 He said, with tears in his eyes, that leaving his UVU team was the hardest thing he had to go through when deciding to accept his new role. 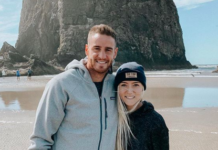 Graduate assistant and former player Nate Austin reiterated the same idea, saying Pope is a relationship-oriented coach. Pope coached two players who received impressive recognition during the 2018-19 season, senior Jake Toolson and freshman Wyatt Lowell. Toolson was awarded WAC Player of the Year honors and was given an AP All-American honorable mention, while Lowell was given the WAC Freshman of the Year award. Toolson spent two years at BYU before transferring to UVU where his playing time increased by more than 15 minutes in his first season. As a player himself, Pope helped the Kentucky Wildcats capture the 1996 NCAA title that was followed by a nine year career in the NBA with Indiana, Milwaukee, New York and Denver. The 6-foot-ten post also played in Turkey. 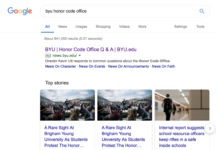 Pope said he sees BYU as the place where he wants to succeed most, more than any other destination.